If you're like most people it's possible you'd never give a roasted cauliflower recipe a second glance if you read about it in a cookbook or magazine. I'll admit, I've always considered cauliflower only the plain, tasteless vehicle for a rich creamy cheese sauce. 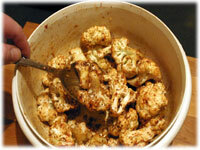 Apart from being one of the most easy grilled vegetable recipes ever, the flavor of roasted cauliflower and spices is really intense. Simply pour a little olive oil and garlic over the cauliflower pieces, toss with a very healthy dose of coriander seeds and smoked paprika then grill over high heat in your perforated grilling wok. Amazingly the heat really makes the flavor of the coriander explode and the roasted cauliflower absorbs all of that flavor, saving it for your first bite. 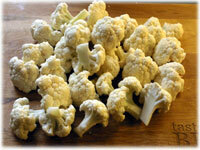 Cut the cauliflower into 2" pieces and rinse well under running water. 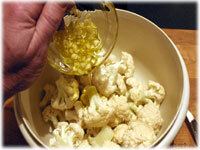 Mix together the olive oil and minced garlic and pour over the cauliflower pieces. Add the coriander, smoked paprika, salt and pepper and stir so every piece is covered well. Setup the grill for direct heat cooking and preheat to 525F - 550F. Spray a perforated grill wok very well with cooking spray then place on the grill to heat up. 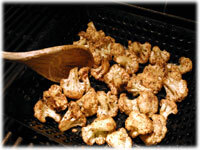 Once the grill and wok have reached cooking temperature place the seasoned cauliflower in the wok to be roasted. Stir often to ensure the cauliflower pieces don't burn and that all sides get evenly roasted. 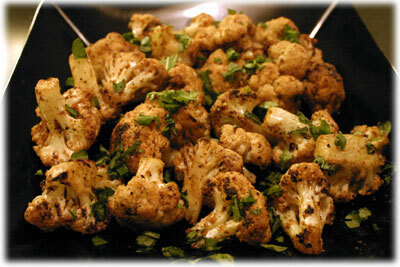 After 10 minutes or when you think the cauliflower is well roasted remove it from the heat to a serving plate. Drizzle with lemon juice and sprinkle with chopped fresh cilantro and basil.